I've learned life lessons and found out who's true and who's fake. During this time, my brain has been on overdrive, so many questions, so many thoughts... So I figured - Why not share those thoughts with all of my readers!? Maybe some of you can relate or maybe even shine some light on a subject that I may be struggling with!? 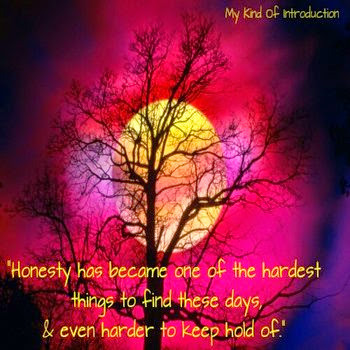 "Honesty is one of the hardest things to find these days, and even harder to keep hold of." What do you think about today's random thought? Have you had someone close to you break your trust by not being honest about something they did or said? Do you have something else you would like to share about Honesty?